In this post, Jay shares his Physics hacks that helped him score an ATAR of 99.15. Jay scored an ATAR of 99.15, received a Band 6 in each of his subjects AND scored 92/100 for HSC Physics! In this post, Jay shares his Physics Hacks that helped him ace the HSC! What follows is a step-by-step process which was a very effective way for me to cover content in year 12. Before I start, I need to emphasise this point. If you want to do well in a science subject without stressing out or rote learning the textbook word for word, you need to enjoy it and understand it properly. You might have bad experiences/difficulties with the subject in the past, or you just never find it interesting, but you can make a change starting now. What Changes Can You Make? How Do You Even Enjoy Science? The more someone forces you to do something or learn something, the more bland and boring it’s going to appear to you. This will also result in content being harder for you to remember and wanting to forget it immediately after the exam. For example, if you memorise English essays word for word, how quickly do you forget them after the exam? If you’re forgetting stuff in science, chances are at some point or another you didn’t understand a concept or understand its significance, and just memorised a sentence or two so you had something to write if it came up in an exam. Would it work if we did this? How come the teacher said “usually?”- is there a case where this particular concept works in a different way? This curiosity will help you enjoy and become interested in the subject. The more questions you ask, the more questions you will be able to answer in the future. So, think of asking questions as “studying” – if you’re not asking questions you’re not studying effectively. And when you ask questions, don’t just say “I don’t get it.” The teacher won’t understand what you’re finding difficult and you’ll just lose motivation. Instead, try to figure out specifically what are you finding difficult. Ask yourself, at what point did you get lost? Below are the steps I used to hack the HSC using the Matrix Physics Course. The night before you go to a Matrix lesson, skim through your Theory Book. Don’t go through it with the intent of remembering everything or learning all the minute detail. Simply flick through it, read the titles, bolded phrases and read whatever catches your interest. This will give you a general idea about what you’re learning tomorrow. While you’re in class, listen to what your teacher is saying. Don’t form judgements on whether you find it hard or easy, if you agree or disagree, etc. just listen to what he/she has to say. Once the teacher finishes a concept, ask yourself “did I really understand that?” – don’t just tell yourself “I’ll figure it out when I get home.” If you didn’t get it, see if you know what your issue with your understanding is. If you do, then politely ask your teacher. If you don’t know what you don’t understand, don’t spend too much time on it. Flag the concept and keep listening to the next part of the lesson. Then speak with your teacher when the class is doing questions, during the break or at the end of the lesson. Don’t spend too much time on it and fall behind, otherwise you’ll be lost for the rest of the lesson because you keep missing key bits of information. Once your Matrix lesson finishes, read through the lesson again ASAP (within 1-2 hours of the lesson). It is critical that you get to it soon after the lesson ended because you will retain information very well if you revise soon after you have learnt it for the first time. Read through the lesson, make sure you understand everything and flag anything you don’t understand (ask your friends if they know the answer). Test yourself by doing the homework. Understanding issue: You answered the question wrong because you don’t understand the concept in the first place. You need to fix this ASAP. Have a read of the textbook again and cross-check your understanding with what it says in the book. Does it match? You should find a spot where you misunderstood something. If you don’t, ask your teacher or book a one-to-one workshop and go through the chapter with a tutor. Terminology issue: You got the question wrong because even though you knew what the answer was, you didn’t use the right “keywords” AKA scientific terminology for you to get the marks. This is a fix that must be done at home. When you understand a concept, the terminology you use to describe it should seem intuitive for you and easy to remember. If you find yourself having to write out the word again and again and you keep forgetting it – maybe you don’t understand its significance in the answer. 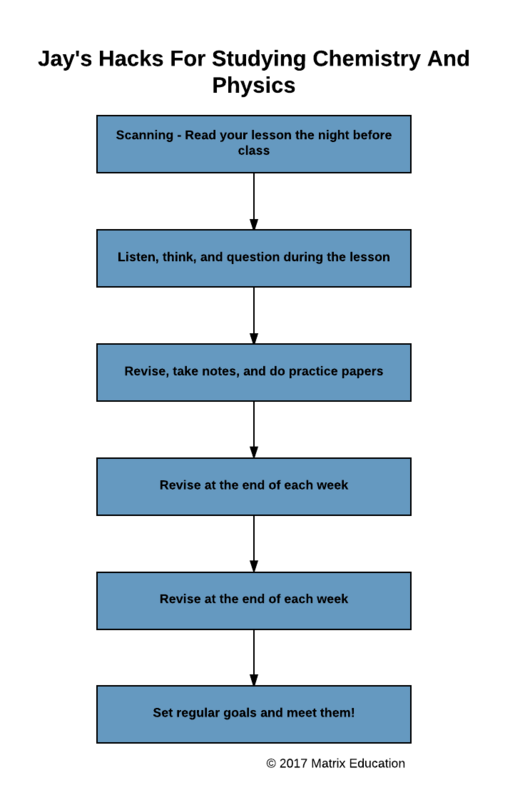 Once the term commences, make notes each week (two lessons per week). This way you will have a full set of notes for that topic before your mid-term exams which are usually weeks 4/5/6. Simultaneously, do past exam papers (two papers per week). Mark your homework (See holiday course for advice for marking). Make notes for each lesson before your next class. Every weekend, you should go through the notes you have compiled so far. This may seem unnecessary but it will help you retain all the content as you learn it. Think about those nights before your exam where you had to cram heaps of information at once. Do your future self a favour. Having just an ATAR goal is not going to motivate you for long. Yes, it will give you some inclination to study, but if you have no idea what kind of marks you need in your school exams for that ATAR you might start slacking off or not realise that you’re underperforming compared to what you need. The way to get a good ATAR is to have a strong average across all your subjects. If you want that 99+ ATAR you need to be aiming for a Band 6/E4 in ALL your subjects. Have a look at how many Band 6’s your school got in the past few years for each of your subjects (you can check online or ask your year adviser). For example, if there are on average 15 Band 6’s in English at your school every year, you need to aim so that your rank at school is in the top 15 to set you up for a good internal mark. If you’re well into the Band 6 range for one subject but way out for another, don’t focus on maintaining rank 1 in your good subjects. Spend time on your weak subject and make sure you’re doing well in everything. Want to ace Physics for your HSC like Jay did? Get ahead of your peers like Jay did with our Year 12 Physics Holiday Accelerated Course. With advanced completion of contents before it’s taught at school, you’ll be well-prepared for your next assessment. Learn more about the Year 12 Physics Holiday Accelerated Courses.